SC Swiderski provides high quality housing at all of its locations. The effort provided by the Construction Department makes this possible. By the end of 2018, SCS Construction had 5 multi-family projects underway. The construction of Urban West is their most unique project and is scheduled to open June 1st, 2019. Grounds keeping is of high priority to SC Swiderski as they strive to have their properties looking their best. Whether it be cutting grass in the summer, or plowing mounds of snow in the winter, SCS’s grounds keepers treat the property as if it were their own. SC Swiderski has an incredible in-house maintenance team that accepts maintenance requests and acts on them promptly. The maintenance technicians are all very professional, and experienced in working within the apartments. The Maintenance Department works closely with the Leasing Department to make sure the units are issue free prior to renting them out. 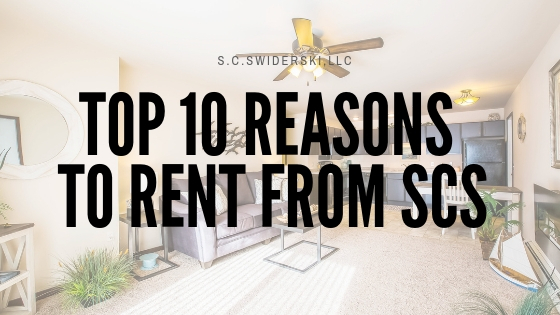 SC Swiderski has implemented software that makes it possible for tenants to see lease documents, view their tenant ledger, make maintenance requests, and setup monthly online payments. This shows that the company is willing to adapt to the times and make changes in order to benefit the tenants. SC Swiderski has property locations all across Wisconsin. They have apartment buildings in 16 different cities which leads to a total of 1,296 units. A major benefit of these many locations is the ability to transfer from one location to another. SCS has an on-site property manager at almost all of their properties. These managers have many important jobs such as being there to answer questions that current tenants may have, giving showings for prospective tenants, or helping new tenants move in. Tenant Satisfaction is very important to SC Swiderski. To show this, they have events that they put on, run by the property managers, which are great ways for tenants to build relationships with the managers, and their neighbors in the community. SCS has 27 years of experience in rentals, and that shows in the way they conduct their business. The company was founded in 1992 and has grown to be a regional leader in the industry. Currently, SC Swiderski is expanding and actively pursuing investment opportunities across the Midwest. S.C. Swiderski, LLC has selected Shepherd and Schaller as a partner for a bike share program at Urban West. Urban West is a new luxury apartment site by S.C. Swiderski located in Wausau that opens in June 2019. “Shepherd and Schaller is a local, family operated business that has served the Wausau community for 70 years with quality products for outdoor activities. We are excited to partner with them to provide our tenants with bicycles that they or their guests can use free of charge,” explained Jacqui Miller, business development manager at S.C. Swiderski. Tenants will also be able to enjoy other outdoor activities like skiing and snowshoeing through Shepherd and Schaller’s rental program. S.C. Swiderski hosted its second annual Health & Wellness Fair with the theme Fitness Fiesta- Spring Into Health this past Friday! Despite dealing with unpredictable weather of rain and snow on the days prior to the event, we had an amazing turnout with over 30 vendors and 80 employees! We started the morning with homemade smoothies, protein balls, swag bags, and speeches from our upper management and our CAS Committee team. Our Operations Manager, Nathanael Popp, discussed the results of our Employee Culture Survey and shared some words of reflection for all employees! After the presentation, we opened up our warehouse for games to be played. Games included Around the World, Push up contests, paper air plane contest, tippy cup, and tug of war! S.C. Swiderski is committed to the health and wealth of its staff and relied on many amazing and local vendors in all areas of physical, emotional, financial and intellectual wellness to set up a booth during our Vendor Fair. Employees got their health passport filled in as they met and interacted with the various booths and watched demonstrations. Our vendor fair was followed up by lunch catered by La Margarita Mexican Grill and a round of trivia questions related to health and wellness including questions about the company! Did you know a group of bananas is called a hand of bananas?! Tons of prizes were given away, too! We were thankful to have some vendors donate prizes, and we also had some lucky winners win an extra PTO day, vouchers to stock up on their SCS clothing and someone even took home a $250 gift card of their choice! A big shout out to our Company Culture Committee headed by Kim Dennee who spent months organizing and planning this event! We appreciate all your efforts! We’re already looking forward to next year’s health fair!